My daughter that is in first grade made paper cranes in her class as part of a fundraising effort for Japan. She was so excited to get to help out and the project also peaked her interest in origami. Well, that and the towel origami that she did with her cousin over spring break. 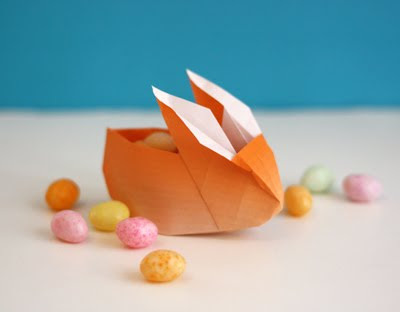 But I know that she would LOVE to make these very cute origami bunnies that I saw over at How About Orange. I just need to watch this video a couple of dozen times so that I can make some with her. I will bring origami paper to Kentucky and we can make these by the dozen. Super cute, I have never been good at origami but might try these. Have you seen Hop- I'm not sure I can eat jelly beans anymore. I'm dreaming of kENTUCKY! My son loves origami. Once I show him this we will have origami bunnies coming out our ears. I'll even bring one with me to Kentucky to show you his skills. I'm dreaming of origami and Kentucky with you.